The first thing I thought when I walked into the Fan Expo earlier today, how many more people can they fit in here? 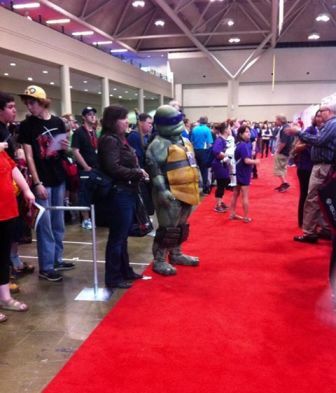 The Convention Centre was booming as day 3 of Fan Expo Canada kept ramping up. More stars, more crazy costumes and more fans than I’ve ever seen in one place at one time. I made my way around the kiosks and stands again today and there still seemed to be more there that I hadn’t seen yesterday or the day before. It’s mesmerizing how many comic book characters people love. I thought it was hilarious to see a gaggle of people dressed at Star Trek characters and only a few feet away a group of Stormtroopers with their guns out. I hung out around the autograph area again as well. I got to say a quick hi to Shawn Ashmore who will be back playing Iceman in the new X-Men movie. I believe the movie may still be filming in Montreal. Going into the Fan Expo now for the third day in a row, I have a handle on where I want to go and what I want to see. Taking a bit more time to check out the crowd, I saw how elated everyone still seemed to be. People smiled and jumped into photos with people dressed up and they all loved it. It’s their time to shine brightly and show off their creativity. I saw a guy dressed as Ironman, but not the clean shiny suit, the suit he built in the cave, in the movie. It was very cool. I couldn’t help buy pass by the Lego stand again and watch people of every age putting together all sorts of Lego contraptions. Some very cool things are happening tonight and as soon as I’m done writing this, I’m heading back towards Front Street. There’s going to be an autograph session with cast members from shows like Defiance, a Q&A with Zachery Quinto (the new Spock) and tonight there’ll be a screening of J.J. Abrams new fall TV pilot, Almost Human. I’m looking forward to that! Previous ArticleFan Expo Canada Recap, Day 2!